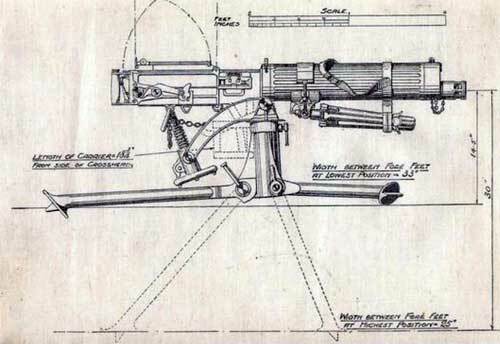 The Vickers Company absorbed the Nordenfelt Gun and Ammunition Company in 1896/97 and in the process gained rights to the Maxim Gun. 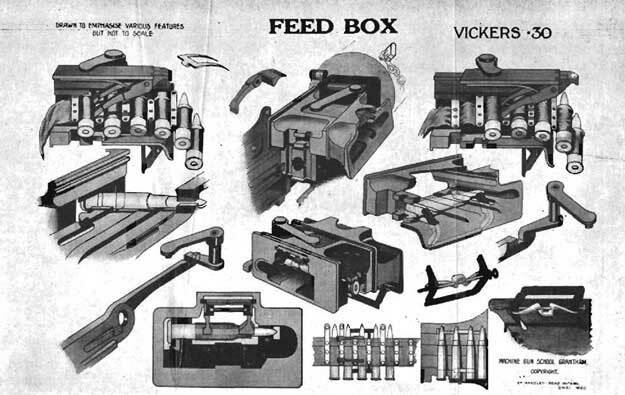 Vicker's engineers went to work immediately improving and simplifying the gun for mass production and filling orders for the British Government. Some parts were eliminated completely and some others were redesigned using high strength alloys. What they finished with was a cheaper to build, sturdy, reliable machine gun. The gun weighed 30 lbs and needed a 50 lb tripod. The cooling system carred 4 liters of water, which boiled away in operation and was recovered by a hose and collected into the water can, which was a standard 2 gallon petrol can. The standard round was the British .303, used by the Lee series of rifles, and loaded into cloth belts. It could fire at a cyclic rate between 450 and 600 rounds per minute and had an effective range of 4,500 yds. The gun was so successful that it was still used in a military capacity into the 1980's, although not in regular army service, but was used by South African Militias. 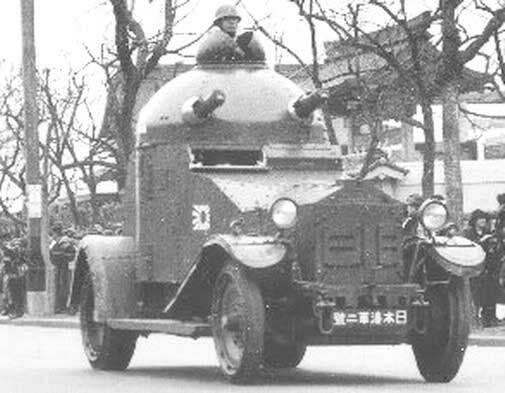 The British used them in various ways, including aircraft and armored cars. 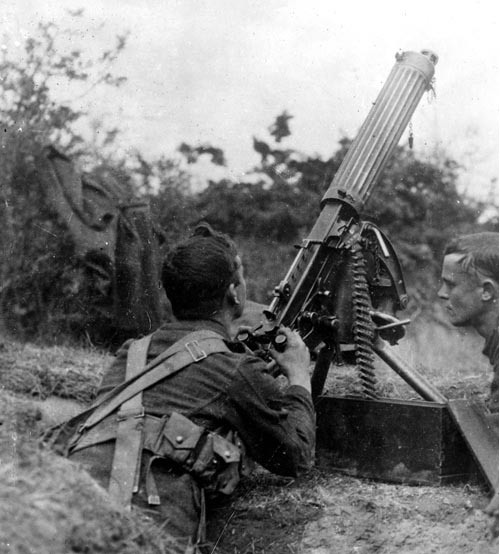 Reliability was never a factor, a case in point is their use in WW1 by the British Machine Gun Corps. On August 24, 1916, the 100th Machine Gun Company supported the infantry in their attack on High Wood. Their 10 guns fired almost a million rounds of ammunition in 12 hours, using over 100 barrels without any breakdowns. 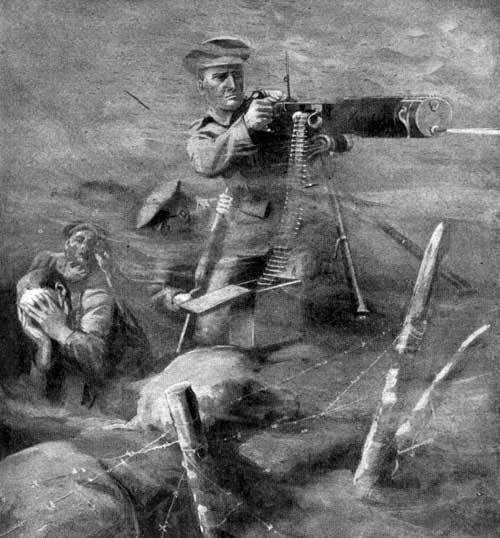 The German Maxim guns during the Battle of the Somme had similiar experiences, much to the chagrin of the British infantry. 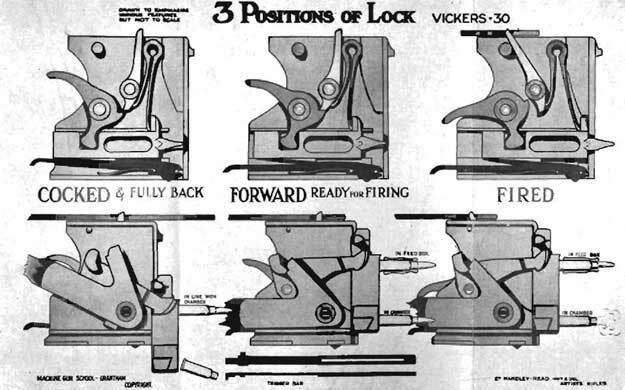 The Vickers gun was slowly issued to troops starting in 1897, in truly pokey British fashion, but by WW1 they couldn't make them fast enough. 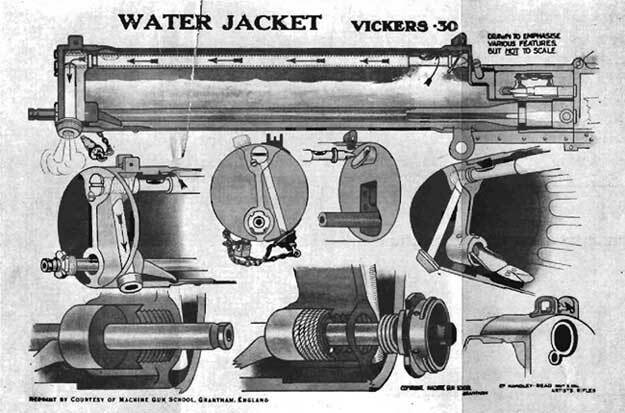 Due to the design where the barrel is linked to the water jacket, it was retained in aircraft guns, though no water was used and the jacket had holes cut in them for better air cooling. 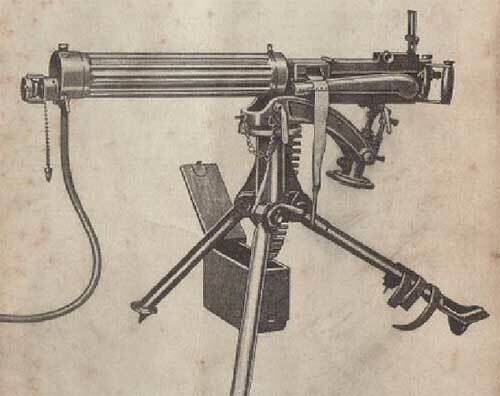 Into WW2, the Vickers use was discontinued for aircraft since it was wed to the cloth belt for ammunition, and the Browning 1919 machine gun with disintegrating links was preferred. The last model Vickers produced on the Maxim design was the Vickers .50 cal anti aircraft and anti tank gun. The bullet was developed from elephant guns and the design was settled in 1921. 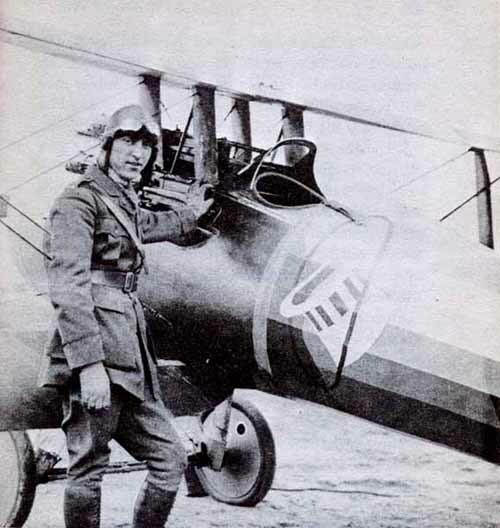 The gun never proved successful, as aircraft and tank design improved. The anti aircraft role aboard ship was replaced by more powerful 20 mm cannon.